www.nightmareshirts.com is a website that offers high quality screen printing of hard to find or unusual designs. They have been around for 10 years and have a wide variety of designs and use very high quality inks and fabric. Pulse redesigned this website which enabled the client to keep its business running smoothly and to branch out and get business in other niche's and mediums. Pulse also helped Nightmareshirts.com to streamline their business and get a better exposure. Pulse developers built http://nightmareshirts.com using .Net 3.5 framework and SQL server 2008 to make it amongst the most successful website of the web 2.0 generation. Fast and secure MySQL and Web servers give you maximum reliability and performance. Most other shopping cart programs have a hard time competing with the system that Pulse Solutions has made for nightmareshirts.com. 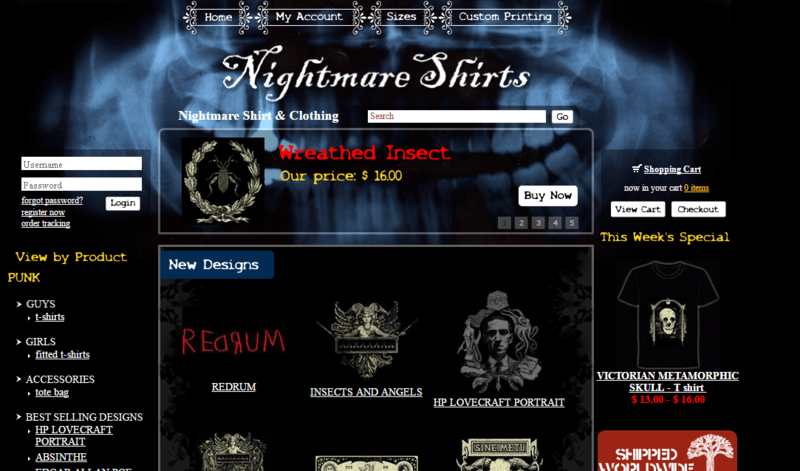 Pulse custom ecommerce components matched perfectly with the scalability and flexibility Nightmareshirts.com needed.